Having produced some highly successful images using medium-format false-colour infrared film, Richard Mosse turned his hand to thermal imaging. Taking artistic thermal images is difficult. This is partly any equipment capable of producing images with anything like a pleasing resolution is extremely expensive and often militarily sensitive, but the way objects give off thermal wavelengths can appear to be unpredictable and somewhat messy. In recent years, thermal cameras have appeared with resolutions comparable with HD TV, and the BBC Natural History Unit shot some fascinating night-time sequences with such a camera. I'm sure military applications have achieved even higher resolution. 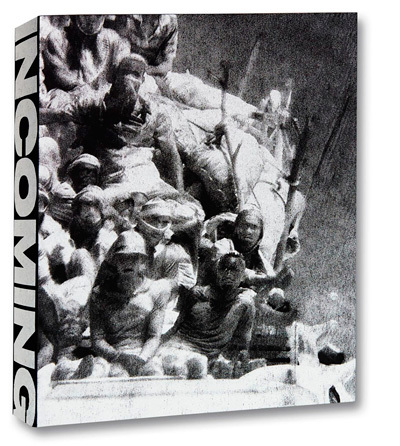 Richard Mosse's book 'Incoming', published last year (and apologies for being slow to pick up on this) ventures into military territory with a combination of high resolution and a very long lens. The military have used long lenses with near-infrared photography since the second world war, making use of NIR's capability to cut through haze over long distances, over 100 miles under the right conditions. Such photos were taken with the equivalent of a telescope as the lens. (There are examples of long distance infrared photos taken using astronomical telescopes, notably at Lick Observatory in the early 1920s.) Now thermal imaging technology allows hyper-long-distance shots using far-infrared radiation, and Richard Mosse got his hands on such a device, with the intention of shooting a movie illustrating the plight of refugees. The results are, in turn, illustrated in the 'Incoming' book. With this level of detail, and a straight monochromatic palette, the results are a surreal version of conventional photography; just slightly out of phase with our usual perception. The down-side is that the camera, with its power-pack, weighed about the same as a person and was mounted in a Steadicam designed for 'old fashioned' 35mm movies. Even then, it lacked anything like conventional controls and had to be operated using an X-Box controller. Some of the shots are from a great distance, and exhibit extreme telephoto effects. Some are much more naturalistic, with the high resolution exposing folds of clothing and perspiration on skin. Some are tight crops. Some, in the book, may not be true thermal images. Can you take a thermal image of the moon? I'm not sure, but to be honest in this context I don't care. This camera is designed for remote surveillance and is described as allowing us "to see the way missiles see" so it may even be a hybrid. Incoming's form factor is also unusual. It's around 7-inches square, over an inch thick, with black edges. Everything is full-bleed with a prevalence of black, and the ink has both a metallic sheen and a slightly oily smell. You don't so much read it as become immersed in it. Almost all pages are images, with two essays at the end one entitles "Biopolitics and the rights of man", byGiorgio Agamben, the other by Mosse himself documenting the process he and his team undertook. More info can be found on the Mack web site, from which you can order the book as well. Despite Kodak discontinuing their colour infrared Ektachrome film several years ago, some photographer have found ways to continue shooting false colour infrared images on film. An enterprising photographer in Germany, Dean Bennici, has sourced, trimmed, and then sold stock of Aerochrome over the past few years. He has recently been offering a negative false colour film, known only as CIR. This is still (just) available and is a 120 roll film. 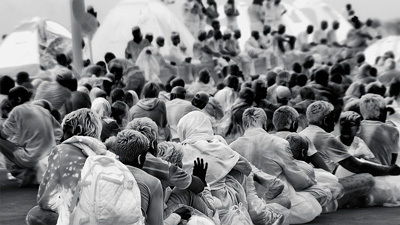 The larger image size makes a serious difference for this kind of image as photographer like Richard Mosse and Ed Thompson have demonstrated. I recently came across the work of Lynda Laird, who has used that CIR film to document what remains of the coastal bunkers that were part of the defences along the Normandy coast. You can find her photographs on her web site, and here is an example. As you can see, the film produces very nice results. Where the film originated is a bit of a mystery. Dean tells me his source was in Russia, but there were no identifying markings on either the canisters or on the film itself. My personal feeling is that it is either Russian or, maybe, from the erstwhile East Germany. I have a document on Soviet Russian infrared technology and I must dig through it to see if there are any clues. After all, there was the extraordinary infrared movie, Soy Cuba, shot by Cubans and Russians using Soviet military-grade infrared B+W film in the 1960s. A couple of the best current books on the techniques of infrared photography are those authored (Photographing the Female Form with Digital Infrared), or co-authored (Infrared Photography: Artistic Techniques for Brilliant Images), by Laurie Klein. "will be showing you the signature look of Infrared Photography. She has spent decades perfecting her craft and now it's your turn to discover this unique style of capturing and enhancing Infrared images". Laurie will cover what infrared photography is and why you might want to choose it, getting started with taking the images and how to post-process for the best results using Skylum's Luminar software. Virtual attendees also get a free set of presets. It's on Wednesday June 13th 2018 starting at 0900 West Coast USA, 1200 East Coast, 1700 UK and 1800 European time. You can find more information, and register, through Skylum on this web page. My attention was recently drawn to an amazing, and freely viewable, archive of aerial images on the Britain from Above site. This features images from the Aerofilms collection of 1.26 million negatives dating from 1919 to 2006 which also includes the AeroPictorial (1934-1960) and Airviews (1947-1991) collections. 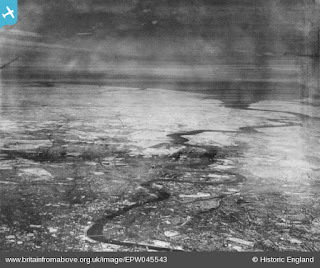 The photograph shows the River Thames in London from Westminster Bridge to the sea, seen from the west, and was taken in 1934. As with all the images here, there is some patterning from the original negatives but they look to have been taken from the open cockpit of a biplane (wing struts are visible in some) and date from 1932, 1934 and 1937. In 1932, off-the-shelf infrared plates were just appearing in shops, from Kodak and Ilford (and possibly others) so this is really early days. The earliest images in the collection predate the aerial shots published in the Times, and are not of such good quality, but I count them as historic nonetheless. If you're interested in further aerial infrared adventures from the 1930s then please check out my post Biggles shoots infrared photographs over Mount Everest. I have always wanted to have the opportunity to take images with a high resolution thermal camera. Some time ago I did do some shooting with the small Flir thermal imager that fits onto an iPhone, the Flir One, but this only has a thermal resolution of 80 by 60 pixels. My chance to experiment with a higher resolution device at IBC was thwarted by the courier company who sent it to Brussels instead of Amsterdam. So in full envy mode I saw an excellent set of thermal images in the Guardian today. 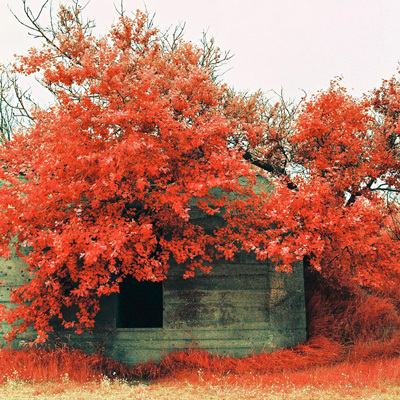 It's not easy to be artistic given the nature of the bizarre world of the far infrared, but photographer Grey Hutton has done just that. He also understands just how far infrared radiation behaves ... and, no, you can not see through walls or even glass. I recommend you look at his images, both on the Guardian web site - Traces of warmth: thermal images of London's homeless - and his own website at www.greyhutton.com. He promises some thermal images from Berlin later, so we should keep checking. To be honest, his are the best artistic thermal images I have ever seen, and a poignant way to document homelessness at a really cold time. It looks as if the game is afoot for artistic thermography, despite the equipment being tens of thousands in cost. Glad to see it. I recently had a bit of a false alarm, or a false positive in data terms, with my eyes. A routine eye test threw up a structural condition that could result in glaucoma and so I was sent off to visit a specialist eye clinic. As I said, the problem wasn't actually there, but in the course of the test I came across a use of near-infrared light that was new to me: OCT or Optical Coherence Tomography. This is an OCT scan of the cross-section of a retina at 800nm with an axial resolution of 3µm. Near infrared will easily penetrate a few millimetres into human tissue and by using a pulsed laser and a lot of computing an image of this type (described as being like 'visual ultrasound') can be built up. If you want to see the techicalities (and some maths) then check out the Wikipedia entry. The particular equipment used for my test was by a company named Optovue.